When I answered, “Isle Royale Greenstone,” she looked at me with new respect. “You’re only the thirteenth customer this season who has answered that question correctly. And we’ve had a lot of people who’ve walked through that door.” She shook her head, a little disgusted that Michiganders weren’t commonly aware of their state gemstone. Most people, if they have any idea at all, would probably say Petoskey is the state’s gem. And it IS the state rock. But Isle Royale Greenstone, or just Greenstone, has been Michigan’s official gem since 1973. Found mainly on Isle Royale or the Keweenaw Peninsula, Greenstone has the fancy, scientific name of Chlorastrolite, which is a variety of the mineral Pumpellyite. It’s often found in and around copper mines, which are abundant in the Keweenaw. The mineral makes its home in amygdaloidal basalt. If you’re like me, that phrase holds no meaning. I had to look it up, so I’m happy to share its meaning. Basically it’s a pit or cavity in the stone. So amygdaloidal basalt is cooled and hardened lava with lots of cavities in it that have been filled in with minerals. 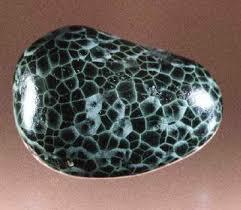 Once the Greenstone is removed from its host rock, it can be cut and polished. But it’s a tricky stone to work with because it’s not really hard–only a 5-6 on the Mohs’ Scale– and it can have its own cavities and hollow spots within it. Cutters want to expose the best “turtle-back” pattern that they can and eliminate any bad spots. But removing a top layer of the stone is likely to reveal a different, and not necessarily better pattern. The goal is a clear pattern showing some chatoyancy. 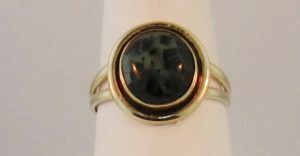 The best stones will demonstrate that change in luster as they are tilted back and forth in the light. Greenstone is not a particularly expensive gemstone to buy. Even with the labor involved in finding, mining, and cutting it, there’s just not a huge market for the material. But it isn’t an easy gem to own. Since the year 2000, it’s been illegal to take Isle Royale Greenstone off the island. The island is, after all, a national park. 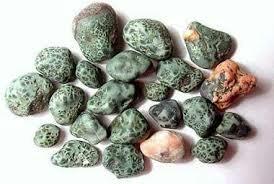 And even Keweenaw Greenstone isn’t easy to get unless you have access to the copper mine areas. 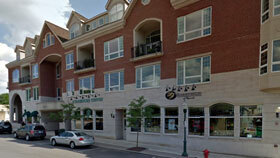 Most jewelry stores, even in Michigan, don’t carry Greenstone. So plan on spending some time searching for your perfect piece of Michigan’s gemstone. Whether you spend time looking along the shoreline for a rare small piece of it, or whether you search for jewelry stores that carry the gem, enjoy the journey. My piece of Keweenaw Greenstone! I love it!! I’ve always been a rock hound of sorts, and many Michiganders share my passion. There’s so much to know about our rocks and minerals. Most of the information in this post comes from a great book called, Michigan Rocks and Minerals, by Dan and Bob Lynch. I’d highly recommend it if you’re a serious rock hound. Their book brought up questions I’d never considered before. *What’s the difference between a MINERAL and a ROCK? A mineral is a crystallized version of a chemical compound. Most gemstones are minerals. For example, a diamond is crystallized carbon. Quartz is crystallized silicon dioxide. Rocks are a conglomerate of minerals. Lapis Lazuli is an example of a gem that’s actually a rock. Its main ingredient is lazurite, but it also has minerals like calcite, pyrite, and mica. While minerals have characteristics, such as hardness or refractive index, that can be identified throughout the mineral, the characteristics of a rock vary depending on which spot of the rock you’re testing. *What’s the difference between rock hunting in the Upper Peninsula vs. the Lower Peninsula? The U.P. and L.P. are geologically very different. The U.P. is formed from volcanic rock. It is rich in the elements of copper, iron, manganese, and even gold. Those elements lend themselves to minerals like azurite, chrysocolla, and hematite. The L.P. is formed from sedimentary rock. It has a lot of limestone, shale, and gypsum. Most of the pretty Michigan minerals, in my opinion, are found in the Upper Peninsula. *What are some basic tools needed to identify rocks and minerals? If you do want to do some rock identification, you’ll need a few simple tools. Of course, an identification book is necessary. 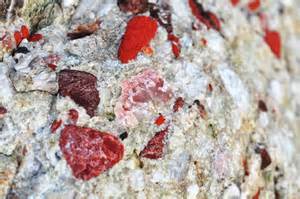 But one of the main ways to identify a rock is by its hardness. The Mohs Hardness Scale measures minerals from 1 to 10, with one being the softest and ten the hardest. Most minerals in Michigan fall between 2 and 7. You can estimate a mineral’s hardness using a scratch test, taking care to scratch the specimen in an inconspicuous place. Your fingernail will scratch a mineral of 2.5 hardness or less. A copper penny will scratch a mineral of 3.5 hardness or less. A piece of glass or a steel knife works on minerals of 5.5 or less, and a piece of unglazed porcelain works on minerals of 6.5 or less. So these four inexpensive tools can really help you narrow down the options when you want to identify your find. Michigan Rocks and Minerals discusses over 200 different materials, giving details such as hardness, common size, and color. The book has color photos of the materials and gives suggestions of where to look for them. 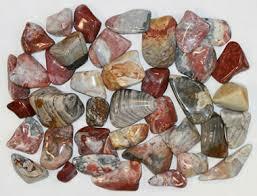 I’ve decided I want to look for Lake Superior Agates, Dolomite, and Pudding Stones next summer when I go to the U.P. Wish me luck! !